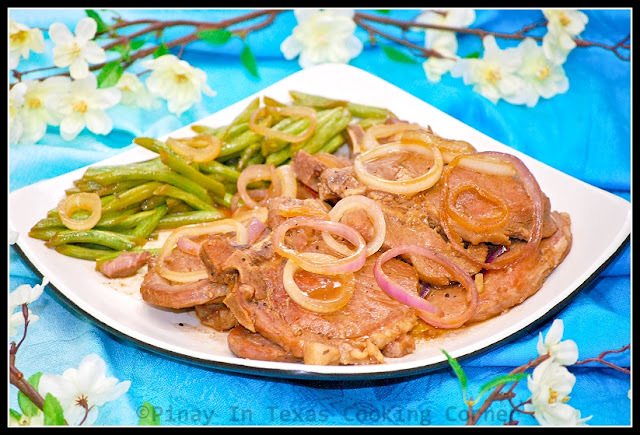 In the Philippines, Pork Steak or Pork Bistek which is a variation of Bistek Tagalog, is a favorite way of cooking pork chops. Though "pork steak" refers to the cut from pork shoulder blade roast, this dish doesn't necessarily use pork steaks. 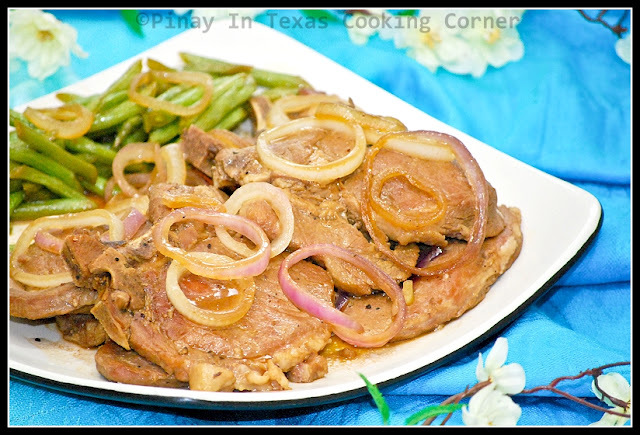 Filipinos commonly use pork loin chops but any other parts could be used. The only reason why pork loin chops are preferred by Filipinos is that pork loin chops sold in the Philippines have fats and skin which add more flavor to the dish. The dish became known as Pork Steak because it is cooked the same way as the Filipino Beef Steak which is commonly called "Bistek". The pork version then became popular with the name Pork Bistek. I've loved Pork Bistek all my life. The best thing about this dish is it doesn't require much ingredients. 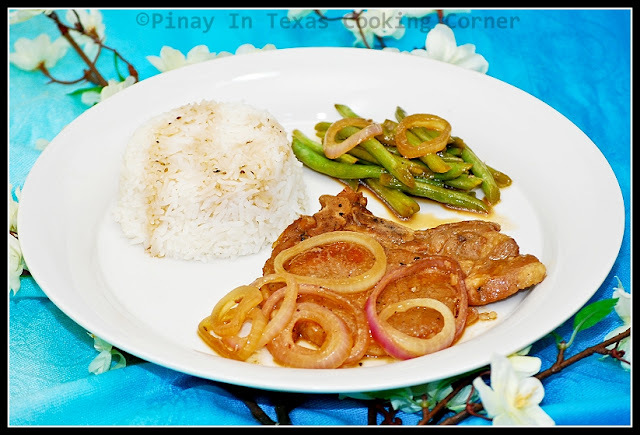 With just soy sauce and kalamansi or lemon, you'll have a scrumptious pork chop dish. If you have onions, it would make it more flavorful. I love it with lots of onions, red and yellow combined. I have a big bag of green beans in the refrigerator so when I cooked Pork Bistek last Monday, I thought of making green beans side dish. I simply reserved some sauce with onions from the Pork Bistek and simmer the trimmed green beans in it until cooked . I'm sharing this on These Chicks Cook and What's Cooking Wednesday. 1. Sprinkle pork chops with black pepper. Combine soy sauce and lemon juice in a large bowl. 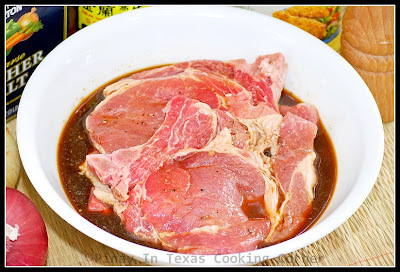 Marinate pork chops in the mixture for at least 1 hour. Drain, saving the marinade. 2. 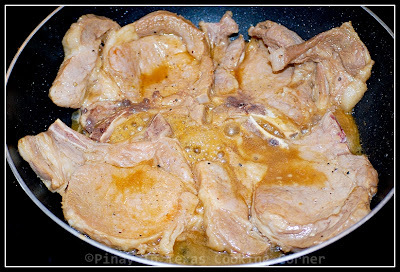 In a large skillet over medium heat, fry marinated pork chops in oil until there's no more red part showing. 3. Remove oil from skillet and pour the marinade and water and let boil. Simmer for 30 minutes or until the pork is tender. 4. Add salt and pepper to suit your taste. 5. Add the onions and cook for 3 more minutes. 6. Remove from heat and transfer to a serving plate. Great post! The food looks delish! Thanks for sharing. that looks so darn good right now I want to stop making the cassoulet I have been working on and dig into this recipe! Love the pork- a piece of meat that never goes out of style! This looks like a nice and simple recipe...:)!! 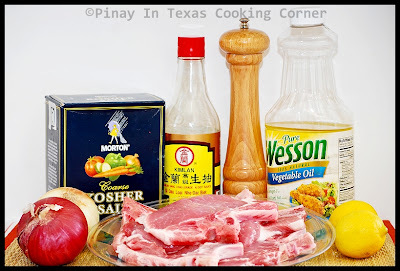 I am not familiar with Filipino-style pork chops, but I am so gonna try it now...;)! It is amazing that so little ingredient can make a really outstanding dish. Thanks for sharing this lovely recipe. I love this dish! So easy and very familiar (because of soy sauce?)! I can eat 2 bowls of rice for this pork steak. What a fabulous dinner. YUM! Always looking for new ways to have steak cause we love it. This is a family favorite...so easy to prepare yet tastes really good! Yum! I love pork steaks and these look delicious! Mine would have lot of onions too (I am a big fan of onion I think they always make a dish special)! I also like the idea of cooking the green beans in the same sauce, they must have been divine! That pork looks so yummy. Your presentation is just beautiful for your pictures :) Thanks for coming by and sharing your recipe. Have a great weekend, Tina. Thanks Johnny! Glad you like it!